to manage your server easily. Explore our panel's useful components on this page. 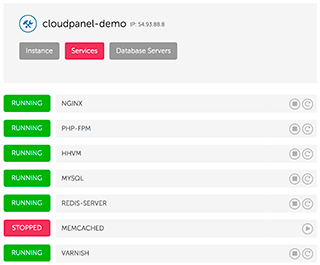 The dashboard provides information about your cloud like hostname, IP address, instance ID and instance type. In the monitoring section, you can find information about CPU utilisation, memory consumption and used disk space. 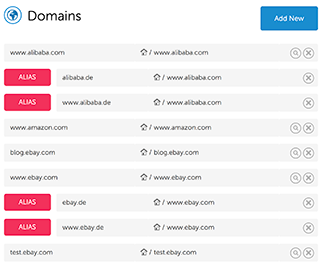 The domain overview site displays all created domains and aliases. 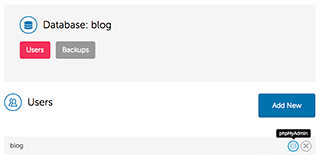 New domains, subdomains and aliases can be easily created with a click on the button "Add New". On the detail page of each domain, you can find the NGINX Vhost editor. With the editor, you can make redirects, rewrites or any changes without logging into the server. 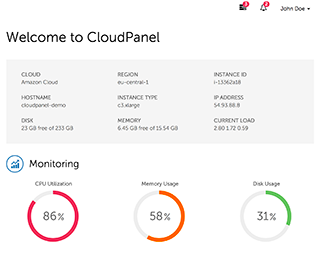 CloudPanel checks the changes before applying, and in case of an error, it rolls back the old version. 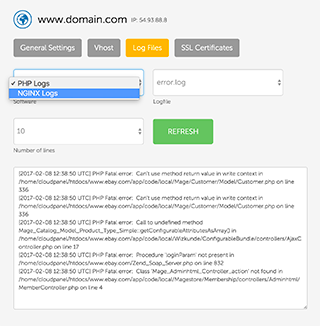 The log file viewer provides an easy and comfortable way to check NGINX and PHP log files. In case of an error, it's the fastest way to check for error messages without logging in to the server with SSH. The log files are rotated daily with a retention period of seven days. Use the drop-down menu to view older log files. With CloudPanel, installing SSL Certificates can be done in no time. Just enter the SSL Certificate, the intermediate certificate and the private key. The SSL Certificate and intermediate chain will be validated to make sure that the SSL Certificate is working properly. 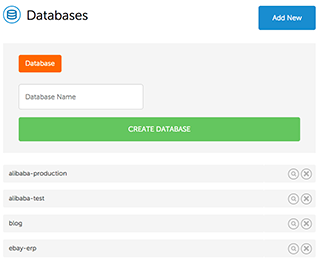 On the database overview site, you see all created databases. Just one simple click lets you create and delete new databases. Each database can be managed with the popular tool phpMyAdmin, which we prefer working with, because we consider it the best tool to handle the administration of MySQL. 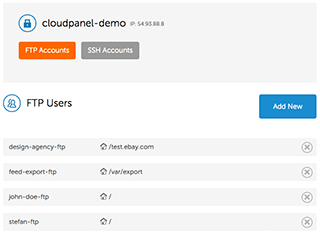 With a click on the button, you will be redirected from CloudPanel to phpMyAdmin. The FTP user listing page displays all created FTP users with their home directories. A new FTP user can be created in no time. 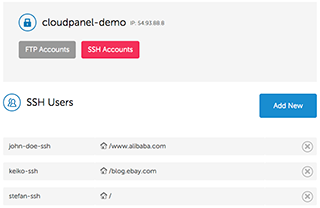 An equal listing page also exists for SSH users and new SSH users can be created in the same way. 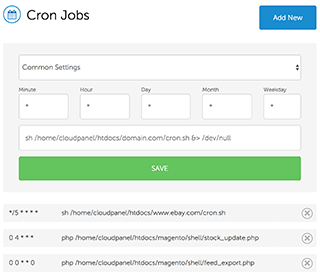 A cron job can be easily added with the help of our templates. Here you can select how often a cron job should be executed. In our DNS section, you can create hosted DNS zones. The hosted zones are created in Amazon Route 53, which is a highly available and scalable cloud Domain Name System (DNS). 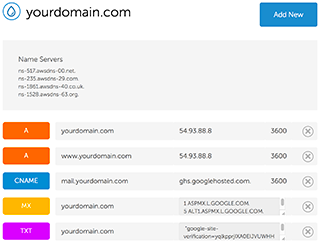 In the detail view of your hosted zones, you can manage all of your A, AAAA, CNAME, TXT and MX records. 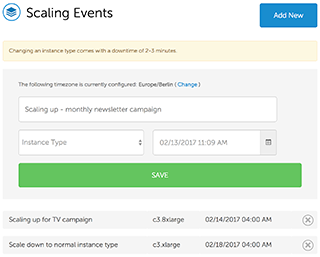 With scheduled scaling, you can scale up and down on demand. You can create scaling events where you can define the instance type and date time for changing the instance type. At peak seasons or during big marketing campaigns, you may need much more hardware resources than usual. 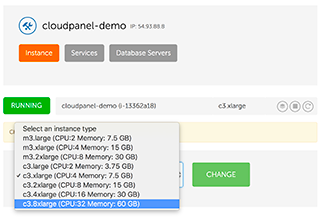 With a single click, you can scale up your instance as high as to 32 cores if needed. Similarly, the function allows you to also scale down in no time. When you need some extra power for a short amount of time, like for a newsletter or a social media campaign, you will love this feature. Go to the tab "Services" to monitor all running services like NGINX, PHP-FPM, MYSQL, MEMCACHED and Redis-Server. Each service can be started, stopped or restarted with a single click.